As the government considers strengthening the UK’s targets, and moving toward net-zero greenhouse gas emissions by 2050, the IGov project has offered evidence to the Committee on Climate Changeon governance of the energy system. Pointing out the multiple, confusing institutions, policies and timeframes that characterise energy governance, IGov argue that governance structures should be reformed so that there is a clear sense of direction, and a shared understanding of the need to transform the energy system. The current system of energy governance is confusing and opaque, to say the least. 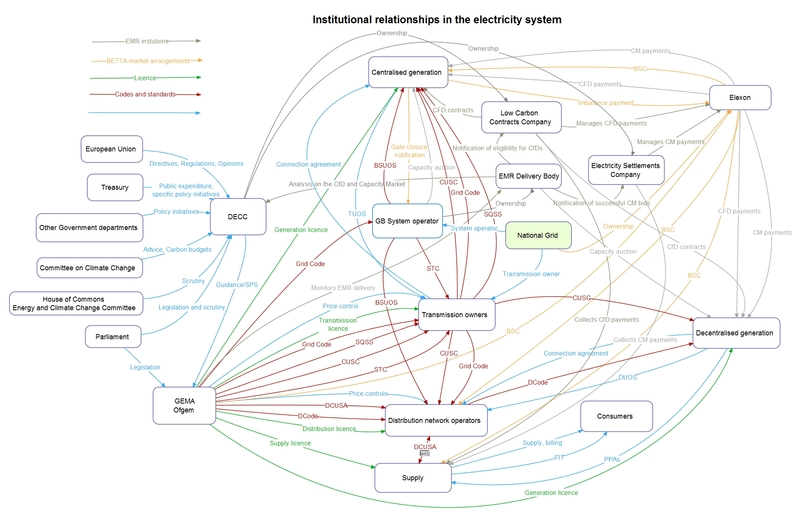 The diagram below, showing institutional relationships in the electricity system alone, was drawn up by my Exeter colleague Bridget Woodman as a teaching aid. She soon realised that her efforts to demystify the system for her students actually laid bare the horrors of mismatched priorities and unclear linkages, as she explains in this blog. This causes problems for carbon targets because it is just not clear where responsibility lies, within this tangled web. For example, the Committee on Climate Change has pointed out the need for a much greater focus on energy efficiency, yet whose responsibility is it to deliver this? More fundamentally, it is now clear that the energy system is changing rapidly, becoming decentralised and digitised; but who is managing this transition, to ensure that innovation brings about carbon reduction and does not penalise vulnerable people? In our submission to the Committee on Climate Change, we argue that significant reform of energy governance is needed, if we are to achieve net-zero carbon emissions. There are three areas in particular that need attention. First, there is a need for a shift to a more people-focussed energy system, which combines consumer protection with a wider understanding of people’s roles as citizens, engaging in the transition to zero-carbon. In the current structure of energy market regulation, people are acknowledged only in their role as consumers of electricity and gas, although they increasingly play other roles, generating their own power, reducing demand, or providing demand response through batteries. People also play a role as citizens, giving (or withholding) consent for energy infrastructure, and voting for (or against) ambitious climate policy. A reformed energy system would acknowledge these varied roles, and put people at the centre of energy governance. Second, energy policy should be more clearly linked with climate change objectives. This could be achieved through a strategic body tasked with overseeing the energy and carbon objectives, in line with the UK’s carbon targets – an ‘energy system transformation commission’. This would be closely linked to the CCC. Such a process would move energy policy into line with the carbon budgeting process, which looks ahead to 2050 and manages a process of change. Third, regulatory reform is needed, moving towards a model of adaptive regulation. Regulation should encourage innovative energy services, linking supply, demand, response and storage; and linking across buildings and transport. This could be achieved in part by the creation of local markets, to oversee distributed generation, supply, flexibility and efficiency services within a local area. There is more detail on all of these proposals in our evidence to the Committee on Climate Change. Of course, reforming governance structures carries risks, like any change process. But the current system is putting a brake on the innovation that we need, and doing nothing carries significant risks too. Bringing energy governance into line with ambitious carbon targets is an important step in the path to a zero-carbon Britain.